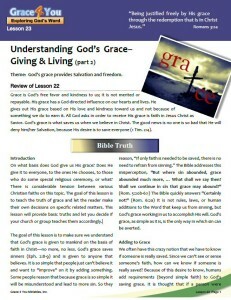 Lesson 23: Understanding God’s Grace — Giving & Living (Part 2) | Grace 4 You Ministries, Inc.
On what basis does God give us His grace? Does He give it to everyone, to the ones He chooses, to those who do some special religious ceremony, or what? There is considerable tension between various Christian faiths on this topic. The goal of this lesson is to teach the truth of grace and let the reader make their own decisions on specific related matters. This lesson will provide basic truths and let you decide if your church or group teaches them accordingly.